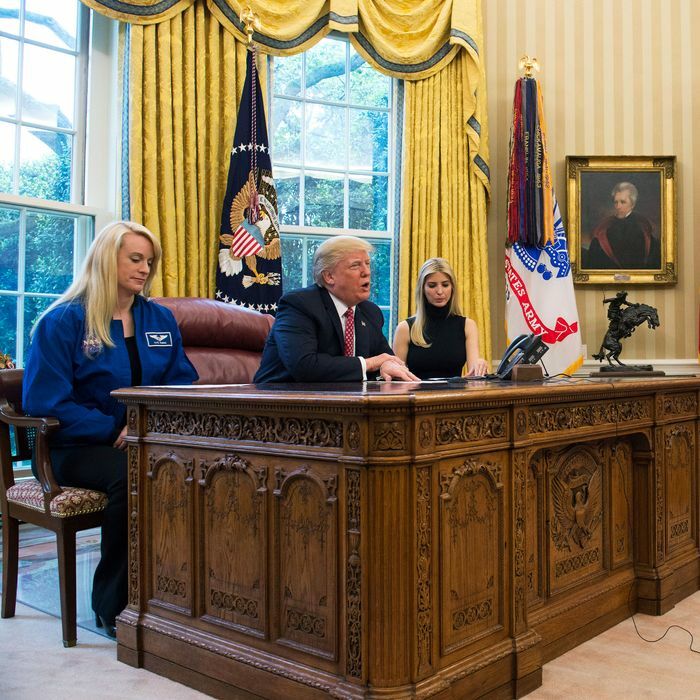 The April 24, 2017 video call to congratulate the astronaut Peggy Whitson, who that day broke the record to become the American who has spent the longest amount of time in space, was an unusually smooth public event for the president. But, according to an excerpt from Team of Vipers obtained by Intelligencer, Trump wasn’t joking. He was suddenly very serious about getting to Mars as soon as possible. Sims detailed the logistics of setting up the call, something that required NASA engineers and diagrams of the Oval Office and a walk-through beforehand. But the most important aspect of the plan, Sims learned, would be the timing. An engineer explained something called “orbital mechanics” to him, how the Space Station would only be reachable during a specific period of about 20 minutes when it was in just the right place. “The President would have to be right on time, a rarity,” Sims wrote. He made it with barely a second to spare. “If I’d ever doubted that his showbiz background actually brought any value to this job, I certainly never would again,” Sims wrote.